Altrincham Football Club will demonstrate their unequivocal support for February’s Football v Homophobia campaign by wearing a kit based on the LGBT Pride flag. The Vanarama National League club, who usually play in red and white stripes, will wear the rainbow kit for the game against Bradford (Park Avenue) on February 16. Club director Bill Waterson said: “We are extremely proud to be able to confirm that all the arrangements are in place for us to celebrate Football v Homophobia month in February by wearing this special kit against Bradford. “We believe it will be the first time anywhere in the world that a senior football club has worn a kit solely modelled on the LGBT Pride Flag, and Altrincham will, therefore, be creating a small moment of football history. “To us, it is a big statement. Altrincham Football Club are committed to creating a welcoming environment for all who attend our games, and our support for Football v Homophobia is part of this commitment. “We would like to thank our main shirt sponsors, J Davidson & Sons, for allowing their place on the front of the shirt to be replaced by the Football v Homophobia logo, and the FA, the Vanarama National League and our opponents Bradford (Park Avenue) for their support of this initiative." The shirts worn by the players during the game will be auctioned after the match, with profits going to the Pride Trust, a LGBT+ youth charity in Manchester. 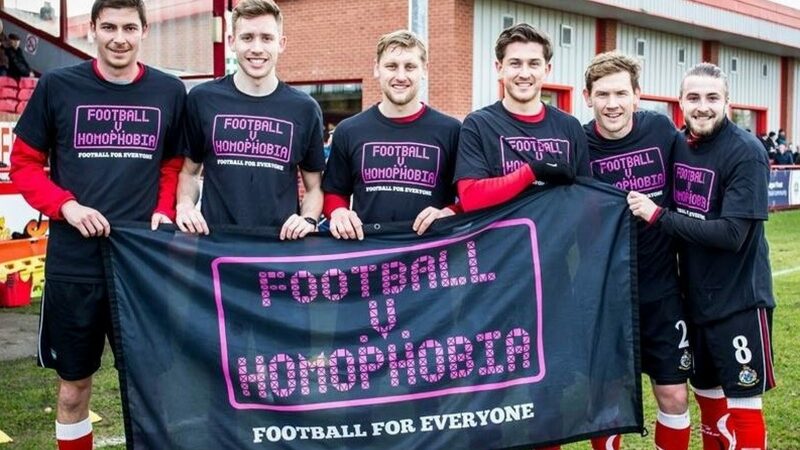 Find out more about Football v Homophobia.